Humanities for the Environment, or HfE, is an ambitious project that from 2013-2015 was funded by a generous grant from the Andrew W. Mellon Foundation. The project networked universities and researchers internationally through a system of 'observatories'. This book collects the work of contributors networked through the North American, Asia-Pacific, and Australia-Pacific observatories. 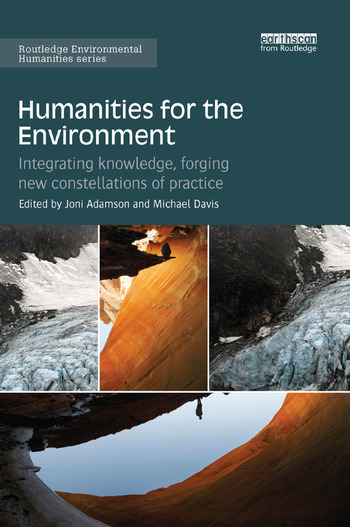 Humanities for the Environment showcases how humanists are working to 'integrate knowledges' from diverse cultures and ontologies and pilot new 'constellations of practice' that are moving beyond traditional contemplative or reflective outcomes (the book, the essay) towards solutions to the greatest social and environmental challenges of our time. With the still controversial concept of the 'Anthropocene' as a starting point for a widening conversation, contributors range across geographies, ecosystems, climates and weather regimes; moving from icy, melting Arctic landscapes to the bleaching Australian Great Barrier Reef, and from an urban pedagogical 'laboratory' in Phoenix, Arizona to Vatican City in Rome. Chapters explore the ways in which humanists,　in collaboration with communities and disciplines across academia,　are responding to warming oceans, disappearing islands, collapsing fisheries, evaporating reservoirs of water, exploding bushfires, and spreading radioactive contamination. This interdisciplinary work will be of great interest to scholars in the humanities, social sciences, and sciences interested in interdisciplinary questions of environment and culture. Joni Adamson is Professor of Environmental Humanities in the Department of English, and Director of the Environmental Humanities Initiative at the Julie Ann Wrigley Global Institute of Sustainability at Arizona State University, USA. Michael Davis is an Honorary Research Fellow with the Sydney Environment Institute, University of Sydney, Australia, and a Member of the Australian Institute of Aboriginal and Torres Strait Islander Studies.